A tiny, flexible, hard-working tool to automate managing & sorting files and folders. Learn more about DropIt features and see how can it help to save your time. DropIt is available in both install and portable packages. Find out how you can contribute to the project to make it better. 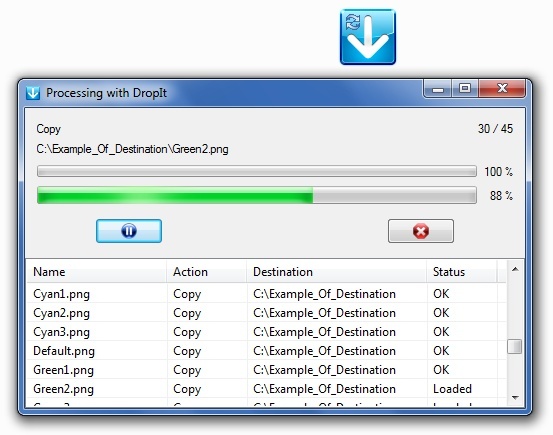 Drop a group of different files and folders on the floating DropIt image and it sorts them to defined destination folders, compresses or extracts them, opens them with associated programs or performs other defined actions. You can define how to filter your files (by name, directory, size, date, properties, content, regular expressions) and associate one of the 21 available actions to perform (Move, Copy, Compress, Extract, Rename, Delete, Split, Join, Encrypt, Decrypt, Open With, Print, Upload, Send by Mail, Create Gallery, Create List, Create Playlist, Create Shortcut, Copy to Clipboard, Change Properties and Ignore). 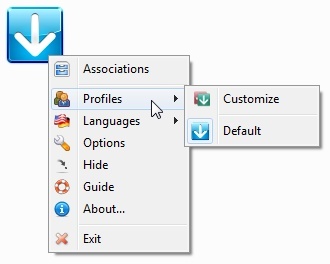 You can also organize your associations in profiles and automatically scan monitored folders at a defined time interval to process included files. Move: to move files/folders to the defined destination folder (for example to organize images by date and properties). Copy: to copy files/folders to the defined destination folder. 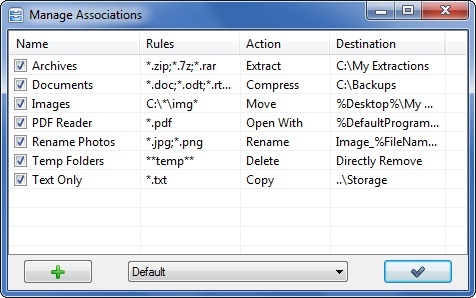 Compress: to compress files/folders in one of the supported destination archive formats (ZIP, 7Z, Self-Extracting EXE). 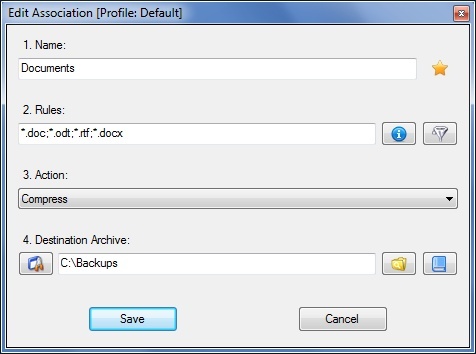 Extract: to extract supported archives in the defined destination folder (7Z, APM, ARJ, BZIP2, CAB, CHM, CPIO, DEB, DMG, EXE, FAT, FLV, GZIP, HFS, ISO, JAR, LHA, LZH, LZMA, MBR, MSI, MSLZ, NFTS, NSIS, ONEPKG, RAR, RPM, SMZIP, SQX, SWF, TAR, UDF, VHD, WIM, XAR, XZ, Z, ZIP). Rename: to rename files/folders with the defined new name (using abbreviations to customize it). Delete: to delete files/folders with the defined method: Directly Remove (files are removed, but they could be restored using a recovery tool), Safely Erase (files are overwritten with the “DoD 3-pass” wiping method, to make them unrecoverable), Send to Recycle Bin (files are sent to recycle bin and are still available from there). Split: to split files/folders in parts with a defined size. Join: to recombine files/folders previously split (automatically trying to load missing parts). Encrypt: to encrypt files/folders in the defined destination folder (to protect your personal data). Decrypt: to decrypt files/folders in the defined destination folder (previously encrypted with DropIt). Open With: to open files with the defined destination program (parameters supported). Print: to print files using default system applications based on file formats. Upload: to upload files/folders to a server using FTP or SFTP protocols. Send by Mail: to attach files/folders to a mail and send them using SMTP protocol. Create Gallery: to create a image gallery in the destination folder (HTML). In particular you can create galleries with several themes like Brochure, Circles, Default, Pile, SquareHeads and many others. Create List: to create a list of files/folders in one of the supported destination file formats (HTML, PDF, XLS, TXT, CSV, XML). In particular you can create HTML lists with several themes like Arrowistic, Casablanca, DeepGreen, Default, Precision and many others. Create Playlist: to create a playlist of files in one of the supported destination file formats (M3U, M3U8, PLS, WPL). Create Shortcut: to create file/folders shortcuts in the destination folder. Copy to Clipboard: to copy the desired file information to the system Clipboard. Change Properties: to change file date, time and attributes. Ignore: to ignore files/folders and skip them during process. Enjoy the time you just saved. Download the archive and unzip it into a folder of your choice. You will need AutoIt to compile the source code. Support DropIt with a donation if it help you or your company to save time and money! DropIt is a completely free open source software. You can redistribute it and/or modify it under the terms of the GNU General Public License. DropIt is provided “as-is” without warranty of any kind, express, implied or otherwise, including without limitation, any warranty of merchantability or fitness for a particular purpose. This software was born from a user’s request and we develop it following your advice, to make a flexible and easy-to-use solution for everyone needing a helper to keep files organized. Actually DropIt and ArcThemALL! are developed by Lupo73, divinity666, tproli and guinness. There are some additional features planned and your collaboration could be essential to improve and test them. If you are a developer who desires to help us, or simply a user who needs help or wants to suggest ideas, you can write in this forum topic or in this contact form. You can also find tutorials and ideas in our Wiki or follow us on Facebook. Finally, if this free software help you or your company to save time and money, you could consider to support its development with a donation.